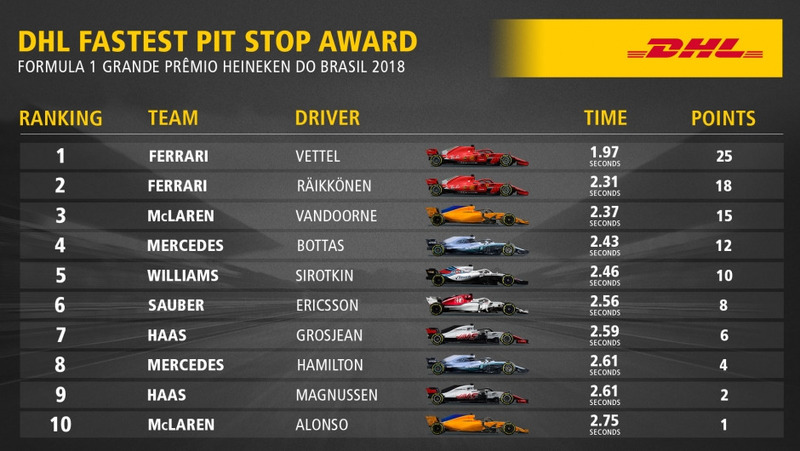 Ferrari perform the DHL Fastest Pit Stop of the Brazilian GP. Sebastian Vettel is dispatched in 1.97 seconds – the fastest tire change of the season so far. Ferrari are currently in a class of their own in the DHL Fastest Pit Stop Award. Just like two weeks ago in Mexico, the Scuderia also enjoyed a one-two victory in Brazil and thereby reduced the gap to Red Bull Racing ahead of the season finale in Abu Dhabi to 20 points. Sebastian Vettel was equipped with new tires during his first pit stop on Lap 27 in a time of 1.97 seconds – the first wheel change of the current campaign under two seconds. Vettel’s second stop on Lap 53 was also lightning fast – the Ferrari crew needed only 2.28 seconds to send the German on his way. The third-fastest stop of the race went to the Scuderia as well: Kimi Räikkönen spent only 2.31 seconds in the box. While the Finn made do with a one-stop strategy and finished third, Vettel missed out on the podium in sixth. 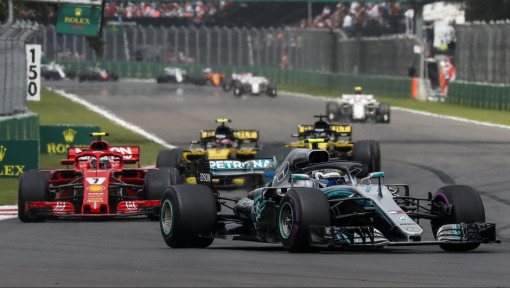 The race was overshadowed by a collision between Max Verstappen, who was leading at the time, and Esteban Ocon who was being lapped – it almost certainly cost Verstappen the victory. While pole-sitter Lewis Hamilton stopped as early as the 19th lap, Red Bull opted for a long first stint. 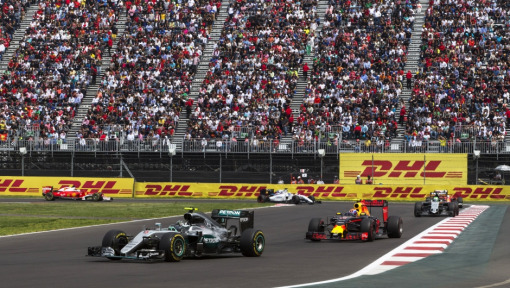 And despite a slow pit stop of 3.05 seconds on Lap 35, the strategy seemed to be working out, because Verstappen was able to exploit his fresher tires to overtake Hamilton and seemed to be heading for victory – until the catastrophic collision. 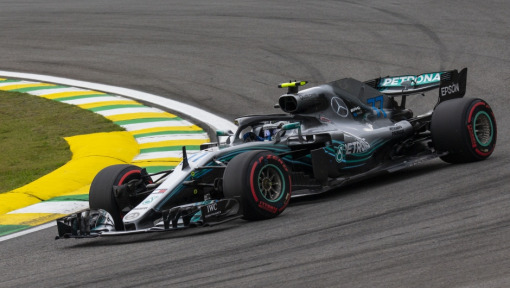 Just how strong Verstappen was this afternoon in Sao Paulo is apparent from the runner-up spot he secured behind Hamilton, a result that was achieved despite heavy damage to his car. Verstappen’s team-mate, Daniel Ricciardo, also put in an impressive performance, advancing from eleventh on the grid to finish fourth. Red Bull made the same choice in the case of their Australian driver, leaving him out for a long first stint which allowed him to overtake multiple opponents. At 2.92 seconds, Ricciardo’s pit stop was unusually slow by Red Bull standards. 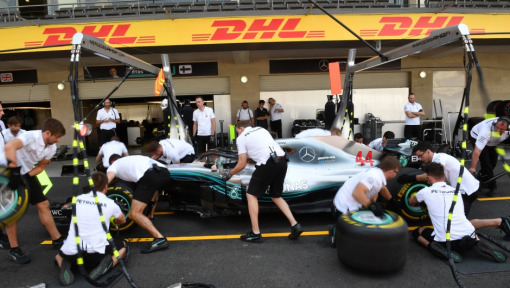 Red Bull Racing have missed out on the opportunity to wrap up the DHL Fastest Pit Stop Award in Brazil and now have to go into a showdown with Ferrari in the season finale in Abu Dhabi. Going into the last race of the season in which a maximum of 43 points will be awarded, they trail Red Bull by a bridgeable gap of 20. Last year’s winners, Mercedes, are 96 points adrift and are now out of the reckoning.